Passengers face difficulties due to the nominal arrangements in the metro stations.Passengers understanding is decreased on Motorbikes . Most of the people don't know about the metro bikes and bicycles were available on the Metro stations. 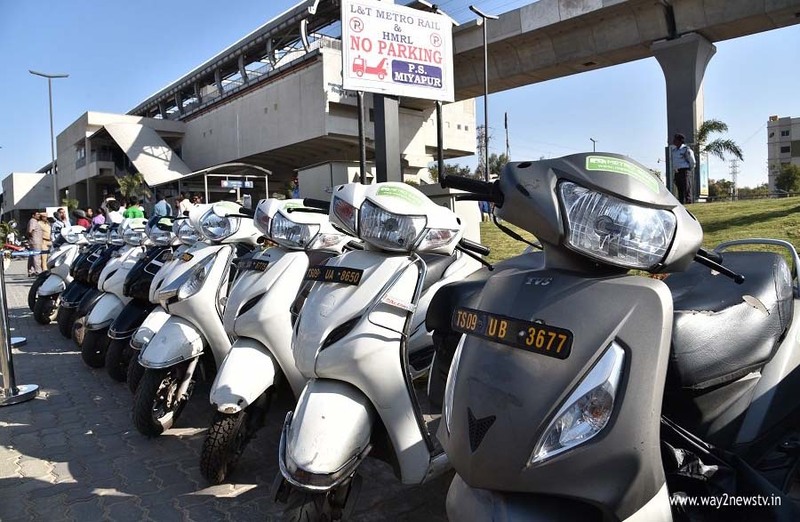 Some metro stations have smart cycles and two wheelers, but the usage is less, you will need to download the metro app on your mobile and book a bike on that app .Bikes can be booked by app or website. Passengers get 18 years of getting a bike, Aadhaar card and license. 25 Metro bikes are available in Myapuz, Nagole and Gachibowli. Smart bicycles are available at Gachibowli, Miyapur Export, Cyber ​​Towers, JNT University Gate and Rasulpura stations. About 81 smartphones are available at these stations, but it is estimated to be around 500 on a daily basis. According to the officials, 10 bicycles are available for 20 bicycles and smaller stations in congested stations. These bicycles are kept at the Hyderabad Biksil Club and Jhumka PEDL firms for passenger use at stations. Many stations do not have smart bicycles available. But in less than 10. There are only 6 smart bikes in the Rasul Purana station. These bicycles are not available in Patni, Paradige, Secunderabad and East. Metro is only available to provide travelers awareness on smart bikes and metro bikes. Passengers want to use smart cycles The first thing to download smart app from Google PlayStore is to register. Bicycle users will have to pay Rs 500 for registration. The credit card, debit and credit card details are required to register. A mobile code on a back-up computer on the back of a smart mobile app shows a code. When the code is entered there, the tubetic lock that bicycle opens up. Metro officials said that the system is also using the metro card. Calculating the time we are rotating until a station takes up at another station. Registration is payable at Rs. 500 and can be used for 30 minutes every day. After about half an hour, you have to pay Rs 10. For a weekly pass, Rs 199 per month, Rs 399 per month, Rs 1199 for 6 months, Rs .1999 per year. If registration does not pass, the rent is to be paid for the first half an hour.